Berekum Chelsea FC are the current leaders of the GLO Premier League 2010-2011, the highest level of league football in Ghana. Chelsea’s success obviously has a lot to do with the attacking trio, consisting of top goalscorer Emmanuel Clottey (born 30.08.1987), the burly Bismark Idan (born 10.08.1989) and skillful winger Obed Owusu (born 16.04.1985), as well as the brilliant midfield trio consisting of playmaker Mohammed Abdul Basit (born 19.01.1986) and the hard-working Yaw Alexander (born 06.01.1987) and Jackson Owusu (born 15.10.1988). However, the defensive line of Chelsea rarely gets attention and in this post I will focus on the brilliant central defender Edward Kpodo – in my opinion one of the most undervalued defenders in the GLO Premier League. Strangely enough, he was not considered for the CHAN-tournament that is currently being played in Sudan. Chelsea have only conceded 15 goals in 19 matches and Kpodo have been ever present in the Chelsea-lineup. Kpodo are currently forming a strong partnership with Paul Aidoo in the central defence of Chelsea. Edward Kpodo made a name for himself playing for Tema Youth FC and I am able to track his career back to 2007-2008. Kpodo scored two goals for Tema Youth FC in 2008-2009 which was not enough to save the club from relegation. In 2009-2010, Tema Youth FC and Kpodo were playing at second level of Ghanaian football. Kpodo made several impressive performances and in March / April 2010, he was training with the Ghana B national football team, preparing for the so-called WAFU-tournament in Nigeria, a tournament for national B football teams in West Africa. Kpodo made the final squad and when Ghana crushed Burkina Faso 4-0 in April 2010, Kpodo scored one of the goals for his country. Edward Kpodo is born 14.01.1990 and turned 21 last month. Although strongly built, Kpodo is not the tallest of defenders. I have seen Kpodo several times and he has impressed me with his calmness, speed, effectiveness and cool style of play. He is also a very skillful and cultured central defender, able to bring the ball forward and pinpoint passes to the front men. 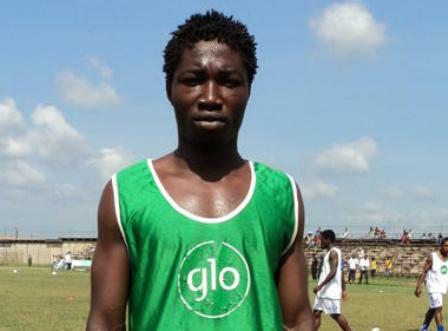 Due to his skills, Kpodo can also play as a holding midfielder / defensive midfielder. Personally I think Kpodo is one of the most interesting central defenders I have seen in Ghana during the current campaign. Edward Kpodo has had a major breakthrough in Ghanaian football this season. He was expressed that he wants to play in Europe, which could very well become a reality. The picture is taken from http://www.berekumchelsea.com.